This time last year it was all about the Kindle Fire. since the Amazon Kindle Fire first hit stores, there’s been a countless number of tablet hit stores. Now that the Kindle Fire is almost history, we’re able to enjoy the Nexus 7. The Google Nexus 7 is starting at an affordable price of $199 for 8GB. Google Nexus also has the latest Android version Jelly Bean, it doesn’t get much better than that! Most of you know me, I am always up to something that requires some type of techy gadget, or gizmo. To lay it out for you, I’m a Tech Geek. If I am going use anything techy, it has to allow me to work while on the go. The Nexus 7 creates a more mobile environment for small business. It is valuable for entrepreneurs, and it’s affordable. I received my Google Nexus 7 16GB Tablet from Staples. The order for my tablet was placed on Tuesday afternoon, and my Nexus 7 was sitting on my desk at wok on Friday morning. Shipping time was super fast. I was only impatiently waiting for 3 days, lol. I am like a total little kid when it comes to my tech products. Yes, fully admit it! I’M A TECH GEEK, and I love it! I have been playing with my Google Nexus 7 for about one week, and am not disappointed. This tablet rocks! The last week, I have been able to blog from anywhere. I’ve always been huge on carrying a notebook, often some of my best ideas come to me while I’m on the go. I’ve since moved on to carrying a tablet. Before I received my Nexus 7, I used to bring along my Samsung Galaxy Tablet. I’ve since upgraded and bring along my Google Nexus 7 Tablet, it’s great. But enough about that, is the Google Nexus 7 even worth $199 (8GB) or $249 (16GB) of your hard-earned money? They say this tablet was built to bring you the best of Google, in a slim, easy to carry, tablet, that fits perfectly in the palm of your hand. In my eyes, they’ve done just that! The Nexus 7 is stunning. 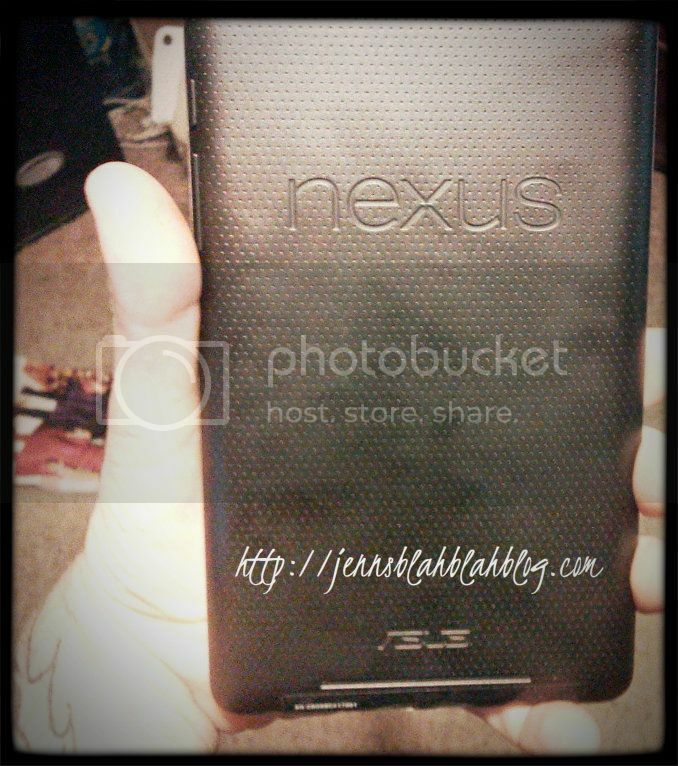 The back is textured and rubbery, with the Nexus name engraved. The Textured rubbery back is great, helps to keep the tablet from slipping out of hands. The scratch resistant glass on the front, and the soft-touch back are joined together by a silver metal frame running around the edges of the tablet. The corners of the tablet are rounded giving it a sleek and classy look, while maintaining the powerful look. They really get the point across – the Google Nexus 7 Tablet is a powerful device, that gets the job done. More than 9 hours of HD video playback, 10 hours of web browsing, 10 hours of reading, and up to 300 hours of stand-by time. Designed with gaming in mind. Comes with NVIDIA Tegra 3 quad-core processor, making everything faster. Powered by Android 4.1 Jelly Bean, the latest version of the most popular mobile platform. Largest collection of eBooks, millions of songs, thousands of movies and TV shows, increasing selection of magazines. Google Play as over 600,000 apps and games. Your favorite Google Apps – like Gmail, Chrome, Google +, YouTube, and more. I have to admit, I giggle ever time I think that Google actually named the latest version of the most popular mobile platform Android 4.1, Jelly Bean. The awesome new operating system brings wonderful features such as faster interface, offline voice typing, improved notifications, Google Now and more.. Here’s a great video that really explains what the new operating system, Jelly Bean. There’s two things I didn’t find over the edge about the Nexus Tablet, there’s no rear facing camera, just a front-facing camera. Second, no slot for memory card to increase storage, it’s a device that’s all about Cloud Storage. However, for me it’s not a huge disappointment, I don’t take many pictures with my tablets, but I know having the camera integrated in valuable for others. I also don’t see myself needing more than 16GB of storage on my tablet, but I know for other this might be an issue. The solid performance and affordable price can help one see past those issues. I had to travel a bit yesterdays, perfect time to put my Nexus tablet to the test. I used Google Navigation, which was awesome. I needed to find somewhere to eat. I simply said, “Google where’s the closest restaurant.” BAM, just like that a list of the restaurants that were in the area! I also had voice navigation to tell me where I needed to go. It was amazing, I have to say it’s the easiest way to find what you need. Whether your searching the web, or looking for somewhere to eat. All you have to do is ask Google, man I love that! I wrote a post yesterday, using my Google Nexus 7 and the official WordPress app for Android. I was able to write my post, and save it until I was able to connect to WiFi. Since the Nexus doesn’t have GPRS, you’ll need WiFi to upload pictures and publish your blog posts. Writing my blog post was a breeze, surprisingly the post needed no edits when I viewed from my laptop. I’ve used the WordPress app from my phone, and other tablets in the past. It’s a great app! Since I carry my Nexus 7 with me, I am glad updating my blog from the tablet is a breeze. The 1.2MP front-facing camera works well. It works perfectly for all my social media needs, I’ve even used it to take a few pictures for reviews I’ve done. If you’re looking to take a picture of your child playing basketball, you’re best bet is to stick with your high performance camera. Like most other camera’s on tablets or phones, it’s great for the small projects. The battery life is great. I the read and browse internet, my daughter watches video’s and my husband plays games. I have not been disappointed with the battery life. We received plenty of browsing, streaming and reading time, before we needed to plug-in our Nexus. The Google Nexus 7 Tablet also offers, Google Now. Google Now is great, it gets you all the right information when you need it. It can tell you today’s weather before you even head out the door, what traffic will be like when you leave your home or head back from work, when the next plane or train will arrive. If you use Google Now you wont miss your favorite team’s score while their playing. All this awesome information is sent to your tablet automatically. There’s an awesome card that will appear throughout the day, right when you need it. I have to say, Google Now is awesome. I don’t use all of the cards, but I am sure they will come in handy one day soon. I absolutely love the appointments, I am always running late because I’m fixing to miss an appointment. I’ve been using Google Now for the last week, and have been arriving early. For me personally that’s worth the $249 the tablet costs! What all does Google Now let you know? Traffic – Get traffic conditions before you head out the door. Find alternative routes to ensure you don’t get stuck in traffic. Public Transit – When you’re near a bust stop and subway, Google Now will tell you what buses or trains or next. Appointments – Google checks traffic, and let you know how long it’ll take you to get there. You even get a notification of when you should leave. Flights – Keep up with flight delays, traffic conditions to the airport for a flight you’ve recently searched. Spots – Stay updated with your favorite team in real-time. Places – Get suggestions for restaurants, and other places of interest. Jump on over to Google Maps to get reviews, make a reservation, or more information. Weather – Shows you the weather from your current location and work. Translation – Find that word, when you’re in need to transition. Time at Home – When you travel to a different time zone. Google now will show you the time at home. The Google Nexus 7 is light, easy to carry, and outclasses any other tablet in its price range. If you’re looking for an affordable tablet, that’s capable of getting the job done. Don’t look passed the Google Nexus 7, it’s a great tablet at an affordable price, and you can pick one up at Staples. I’ve always enjoy Android operating systems, but I think has taken things a step further. 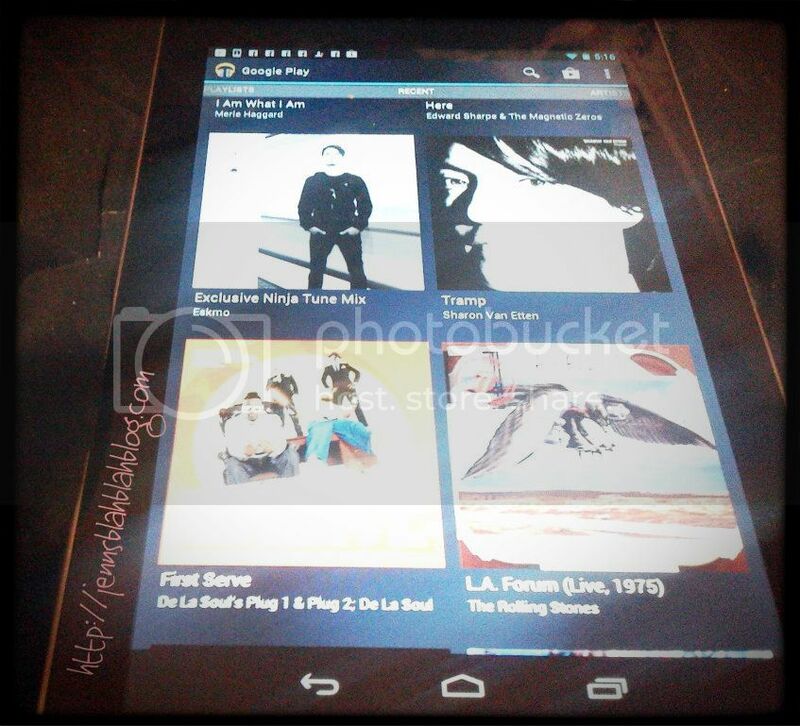 I was surprised by how much I enjoyed using the Nexus 7, and it’s truly an electronic device with consumers in mind. I enjoyed using it, and I’ve actually took my Samsung out of my handbag and carry my Google Nexus 7 with me. This device won’t replace my iPad, but I don’t think it’s intended to. It will however be with me while I’m on the go. Unlike my iPad, my Nexus is small enough to carry with me, in my handbag. So it will be my tablet of choice while on the road. If you’re on the market for an affordable tablet that gets the job done, I highly recommend the Google Nexus 7 Tablet. It’s a powerful device, that gets the job done, and you can pick one up at Staples for only $199 (8GB) or $249 (16GB). In the end, YES! I do feel that the Google Nexus 7 Tablet is worth $199 (8GB) or $249 (16GB) of my hard-earned money. Thanks Staples for providing Jenn’s Blah Blah Blog with this wonderful tablet to review. I used Staples for work, order all my office supplies from them. I’ve always appreciated their customer service, fast shipping and attention to detail. I was surprised when I learned about everything they carry. WOW, I have to say they carry just about everything. They really think about different types of offices when they order products. They have everything for me to effectively run a bank, as well as my blogging business from home. Staples will be seeing more orders from me. It’s been a wonderful experience, and I cannot thank you enough. Be sure to swing by staples for not only your small office supplies, but your large ones too. I cannot wait, they’re allowing you to Pre-order the Window’s 8 device with free data transfer, free training, free support, and free start-up. You can visit a staples near you, or swing by their website and check out everything they have to offer. Great review, thanks Jenn. I'm getting at least two tablets as gifts this holiday season, Google Nexus sounds like a great option.